The movie is a sequel of the games and anime of Yokai Watch, where we will see the story of Natsume, Keita/Nathan´s daughter. 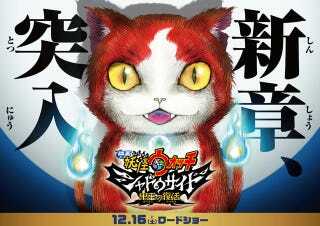 “In the Yo-kai Watch Shadowside: Oni-ō no Fukkatsu film’s story, there used to be a boy who could control yo-kai with a mysterious watch. However, he became unable to see yo-kai when he became an adult. With the boy’s duties finished, the watch was buried away in space-time. Then 30 years later, quiet everyday life comes to an end as a fateful day begins with a comet drawing near. The terrible yo-kai virus Onimaro infects people’s malevolent intentions and spreads infinitely. The one chosen by the yo-kai watch is the one who can save humanity from its crisis. The bond between humans and yo-kai may be recovered with the attainment of a new yo-kai watch. The series creator, Akihiro Ino, is supervising the project and has labeled it as a new form of Comedy Horror movie that both young and old can enjoy.